A detailed guide is a content type used for answering specific, task-oriented user needs or providing advice to specialist or professional audiences. 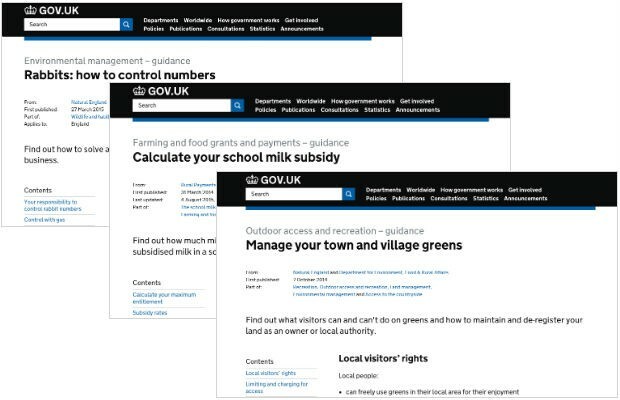 There are more than 4,000 detailed guides published on GOV.UK, on topics ranging from calculating your school milk subsidy to managing town and village greens. Until recently, you would have found a detailed guide under the ‘root’ URL. For example, the detailed guide on how to solve a pest problem with rabbits was at www.gov.uk/rabbits-how-to-control-numbers. This is unusual. Content on the root URL is typically designed for a large audience, and meets a high volume, mainstream user need. This could be a guide about paying income tax or the start page for the register to vote service. This allows users to find the same type of content (ie all publications) under a consistent path. For example, all publications can be found under /government/publications. We’ve made detailed guides consistent with this by moving them all off the root URL and onto /guidance. This puts them under the same path as manuals, which are also created for specialist users (though for longer and more complex pieces of content). Each detailed guide has exactly the same slug (ie the last part of the URL) as before. The content is the same, and the detailed guide appears in the same way in internal and external search results. We’ve put redirects in place, so users who’ve saved the old URL for a detailed guide will still be taken to the correct page. All new detailed guides will automatically be created under the /guidance path. This work is part of making GOV.UK simpler to navigate for users, though most users won’t notice any change when looking for an individual detailed guide. Government publishers need to check the places they’ve published the URLs to any detailed guides, and update these links. Publishers should also be aware that there will be some changes to their analytics. When you look at analytics for a specific detailed guide, you need to search by its old URL (ie www.gov.uk/thing) to get analytics before mid August 2015, and by its new URL (ie www.gov.uk/guidance/thing) for analytics from mid August 2015 onwards. While we were completing this work, there was a period when each detailed guide appeared under 2 URLs, its root URL and its /guidance URL. This was because we wanted to make sure all the new /guidance URLs were working correctly before we set up redirects to them from the root URLs. You should be aware that you may therefore have analytics reports that show data for detailed guides under both URLs between 6 August and 26 August 2015. Finally, you should update the URLs for detailed guides in analytics reports where you’ve filtered content by URL. Reports where you’ve filtered content by anything else (ie page title or format) will be unaffected. Will users soon be able to find this 'guidance' if they select 'guidance' in their specialist search box at https://www.gov.uk/government/publications? Hi Liz - sounds like a potential further step. Right now the guidance in the publication filter is limited to Publications > Guidance content types. Hi Lisa. There seems a major flaw in this re-categorisation: http://www.gov.uk/guidance redirects users to http://www.gov.uk/government/publications but you say in your comment that detailed guides aren't yet in the publications filter. I'm sure some users will edit the url trying to see a list of all /guidance but won't be able to! I think detailed guidance needs to be included in the publications filter (like they are in the document type 'policy' filter, once you click on a policy), because many 'publications' were just PDF guidance that are slowly being re-written into web pages, which might be a 'detailed guide' or a 'publication' with a HTML attachment. The distinction is so subtle and making it harder to find guidance, regardless of the format. Just to clarify, detailed guides haven't been recategorised, nor physically moved. They have been moved off the root URL, so that is protected; however users will continue to find them in the same way as they did before. Re: whether they should/shouldn't appear in the publications filter, I think the question is more about whether users are finding the answer to meet the user needs they have. If the evidence shows that people are expecting to find the answer to a need that is usually met with a detailed guide via the publications filter, I'm sure that's an approach the GOV.UK team will be keen to test and explore. If redirects are in place, why do "Government publishers need to check the places they’ve published the URLs to any detailed guides, and update these links." ? Hi Andrew. Good point. I intended to take that out before publication. It's worth amending links when you come across them, even though redirects are in place. There's no need to do a proactive exercise like this suggests though. It's perhaps worth noting that the old links do appear in broken links reports, and are shown as broken links in the content management system, so they may need to be amended and fixed. I still don't understand the rationale for these longer URLs. It does seem counterproductive to make every one of these 4,000 or so URLs nine characters longer, just in case another organisation needs a particular address, particularly as '/guidance' doesn't appear to add any helpful info for the user. I still think 'detailed guide' is a bit of a misnomer. Some of these guides are much shorter than the longer guides for the public. Does that mean the public guidance is 'detailed'? And isn't it also 'guidance', as with the more niche example? There are also lots of inconsistencies in the way content is categorised as 'mainstream' or 'specialist'. For example, a page on continuing professional development as an approved driving instructor is in the section for the general public (www.gov.uk/approved-driving-instructor-adi-development). This may be less of an issue if all the content is easier to find, but I can't see any references in the nav now to the supposedly 'detailed' or niche stuff. For example, the immigration appeals section for the public (www.gov.uk/browse/visas-immigration/immigration-appeals) links to detailed guidance for immigration staff, but doesn't refer to the guidance on special immigration appeals. This is also missing from the lists of guides listed under 'topics' http://www.gov.uk/topic. The actual http://www.gov.uk/guidance URL doesn't give you any info on what guidance is available, but redirects to the publications section http://www.gov.uk/government/publications, ie a lot of downloadable PDFs and so on. Users could find content previously under a consistent path, on the root URL, as with the more popular content. I doubt that anyone outside government cares whether /guidance/ signifies that the guidance is from a specific department. However, it might be helpful for users and improve search engine optimisation if the guides in question were published in a folder labelled for the audience in question, such as gov.uk/farming/, but that will be more difficult for grey areas where the public and specialists will be interested in seeing all of the relevant content on a topic. Going back to immigration, the public guidance will be of interest to lawyers and advice workers as well as immigrants and asylum seekers. And the special immigration info will be of interest to friends and family of people being removed from the country on security grounds. Are there any plans to make the information architecture more consistent and joined up? This piece of work is not about moving the actual location of detailed guides on GOV.UK. Users will find the content in the same way as they did before. Appreciate this could have been made clearer. The main purpose of this work is to move this content off the root URL. This was an anomaly. It meant that editors could unwittingly publish something at, for example, gov.uk/abc - and that URL may be needed for an organisation. Detailed guide is an internal term for a content-type. Hence the length/complexity of content in this content-type should be that which is necessary to meet the user needs it has been written to meet. I'm not sure it's helpful to compare other guidance content-types. The detailed guide content-type was designed to help users with what would likely be longform guidance. You're right in that different content-types were created to meet the needs of different audiences. There's a project underway here to look at rationalising the many content-types we have, as we all are aware users don't distinguish between content-types in this way.